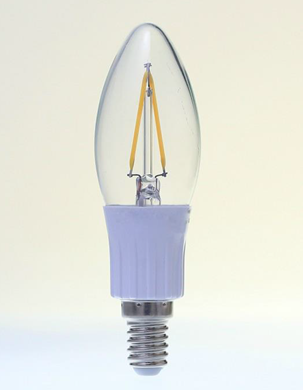 The new Torpedo tip bulb is very much like the Flame tip bulb in that it solves the previous problems of LED bulbs. It has a reduced heat sink that makes it lighter and the new patented “array” filament that doesn’t cast a shadow when lit. The Torpedo tip bulb has the same specifications of the Flame tip as well. It out performs and out lasts any incandescent bulb. It uses less than 90% of the energy of an equivalent 50 Watt incandescent light bulb. Making the 4 Watt Torpedo tip bulb a great stylish in-home, incandescent replacement. • High Lumens Per Watt – Up to 100 lumens per watt. • High Color Rendering – 80 CRI.